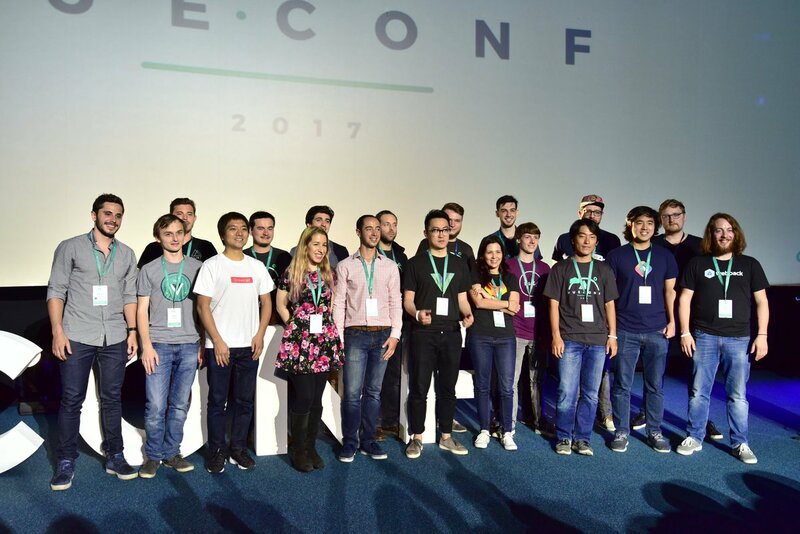 The Vue community is just awesome and everyone at the conference was so excited to meet other Vue people. It looked like everyone admires the work the rest of the community does. We had the opportunity to hang out with lots of you guys and it was so much fun. Looking forward to meeting you at the next Vue event. I, Alex, attended Evan's workshop and I can say it was really great. We started by learning how to build Vue's features, like the reactive state. Later, we dove into High Order Components, render functions, and other interesting stuff. My favorite part was the plugin development. It was crazy developing plugins like Vuex, Vue-router, and form validation by ourselves (and Evan's help) - it really gave me a new perspective on why these tools work the way they do. I loved it! Unfortunately, we couldn't attend Sarah's workshop (we are only 2 guys xD). We heard though some really nice feedback from the attendees. Most of them got surprised by the content of the workshop. They weren't designers and they couldn't even imagine that they were able to create cool animations by themseves - with the power of Vue and SVGs. As Sarah states, The web is more than a document reader, and Vue has unique offerings that make animations not only possible, but possible to do in an organized and state-managed manner. To get a better image of Vue's state check Evan's slides. The Chopin brothers gave a great presentation on Nuxt.js - The Framework for server-rendered Vue.js applications. By running npm run dev you get a server running at localhost:3000 with hot reloading and other goodies. Nuxt also provides a HackerNews clone example. Callum Macrae, brought to everyone's attention the problems some people with disabilities may face, when navigating poorly designed websites. Web accessibility (also referred to as a11y) is the design and creation of websites that can be used by everyone. When sites are correctly designed, developed and edited, all users have equal access to information and functionality. Here is an interesting topic on accessibility, coming from React. Check out an accessibility audit tooling for the web - a11y and an article from Callum on how you can use a screen reader to test your websites. Vetur is a Vue.js plugin for Microsoft's Visual Studio Code. Pine's talk regarding this tool may have convinced a lot of people to switch to VS just because of the great features it offers for Vue.js. Take a look how vetur can help you improve your workflow. The v0.8.2 was released on the day of the presentation, with prettier integration coming soon. You can find the presentation slides from VueConf regarding Vetur here. 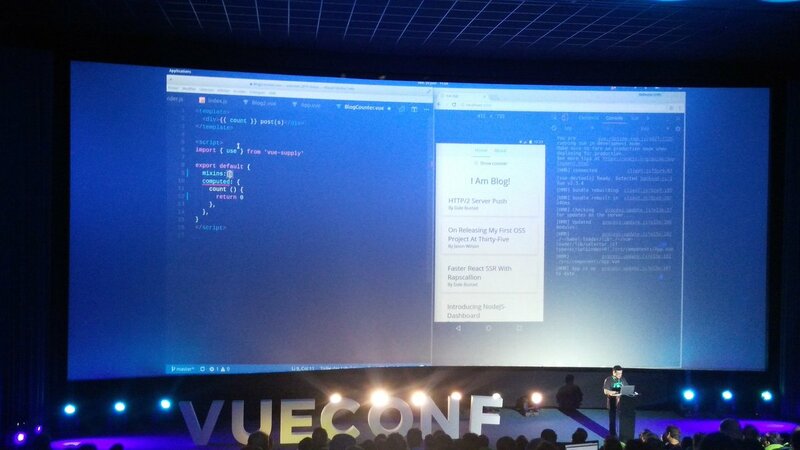 Alright, Sean Larkin made many jaws drop at VueConf by demonstrating Code Splitting Patterns in Vue.js. A lot of people were amazed by how easy it is to split an application's code. Christiaan split his code during the coffee break and managed to reduce the initial bundle size by more than 60%. Philipa talked about how GitLab switched from CoffeeScript to ES6 and how they managed to include Vue.js in their stack. GitLab now combines Vue.js with jQuery and despite a few issues they might be facing, it's a smart approach instead of refactoring everything. Their basic architecture is to create small Vue applications, like small SPAs. Philipa shared her experience on the conference, so if you are interested, read her article. Eduardo gave a great talk on integrating Vue with Firebase. For you, who haven't heard of Firebase before, it provides features like a live database, authentication, and pretty much everything you need to publish a serverless application. What I liked in his talk was that he didn't only focus on the good parts but instead he mentioned the drawbacks, when not to use it, and alternative solutions. Masahiro talked about Onsen UI, a library of UI components and utilities to help you create beautiful hybrid apps very quickly. Implemented on top of Web Components, Onsen UI is an agnostic framework and can be easily combined with Vue.js to bootstrap your apps. It provides a Vue-like API to make its usage very simple and straightforward. I can't wait to find some time to build a mobile app, in order to give it a shot. Oh, I didn't mention that it is open-source! Both Eric and Guillaume have made a great impression, after building a GraphQL server and consuming it with Vue & Apollo. The biggest part of the presentation performed with live coding which was pretty impressive! Here you can find the GraphQL Demo Code and the GraphQL Demo in Launchpad. Guillaume picked up where Eric left it. He showed how to consume the API with live coding, using vue-apollo and vue -supply. During a conversation we had later, he explained a lot of aspects of GrapfQL and how convinient is to work with GraphQL, on the backend but even to consume in the front-end. What drew my attention was graphiql, a graphical interactive in-browser GraphQL IDE, that lets you browse your API and even use it as a documentation. I am considering giving it a shot, in my next Laravel/Vue project. Jacob's talk covered the basics of serverless technology. He explained the benefits of using Function as a Service (FaaS) and how StdLib can help us ship Vue applications in record time. StdLib lets us turn functions into infinitely scalable, self-healing web services. It is open-source and it offers a hosted collection of tools. Blake showed us how to make real-time PWA apps with Vue.js and Websockets. He also showed a very clever way to make apps work offline. You can find the slides and the code examples of this presentation on GitHub. Last but not least, was the presentation of Sarah Dranser, and it goes without saying that she did an amazing job, dazzling us with animations created with Vue.js and SVG. The information on how people feel while waiting and how delays may affect your sales, were pretty scary. Bonus: a small demo showing custom page animations with a fake typography site using Nuxt page transitions with SSR. We could elaborate more on each talk but this article turned up unexpectedly huge, we hope it's worth it. 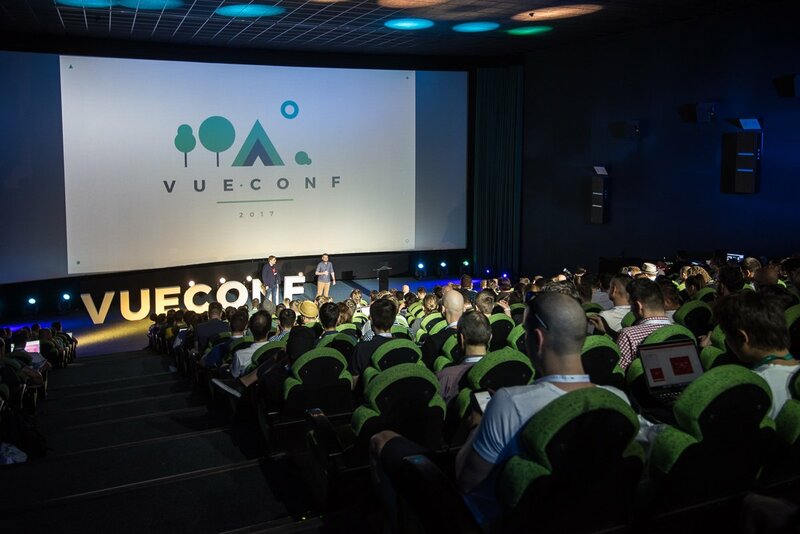 We thank a lot the organisers: Monterail, Evan You and Damian, and the sponsors: Codeship, Monaca, and Native Script for making VueConf a reality. Przemek Peron has uploaded some photos from the conference, you may find yourself in there. The guys from Monterail are going to publish soon more photos and the recordings of the talks. Can't wait to visit Wroclaw again next year and meet even more amazing people - See you all there!